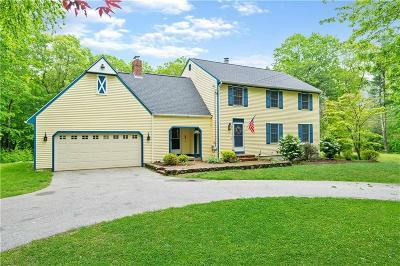 Welcome home to this 3-4 bed colonial situated on a cul-de-sac in the Whispering Pines neighborhood. Set on 2 acres, the property is great for year round entertaining! Features include a large eat-in kitchen which opens to a fireplaced family room with built in bookcases. There is a separate dining room which opens to the formal living room with an additional fireplace. Upstairs is a master bedroom/bathroom with double closets, 2 other bedrooms and a full bathroom with double sinks and private shower room. The spacious bonus room is currently being used as a bedroom, and has many possible uses. The deck off the family room overlooks the gorgeous 8 year young, $110K heated inground pool complex with cabana/shed and fire pit area. Be sure to check out the virtual tour link and then schedule your private showing of this lovely home!